The Russian member of the board of directors of English football club Bournemouth tells the story of how he took the team from the Third Division to the English Premier League in just three years. Three years ago, Russian businessmen Maxim Demin became owner of the English club Bournemouth, and his friend Alexey Panferov joined as a member of the board of directors of the club. At the time of purchase, the club from the small southern coastal resort was playing in League One in England – the country's third-tier division, above which it had never risen. In three years, the Russian managers achieved what had seemed the impossible and took the team from the Third Division to the English Premier League. Bournemouth member of the board of directors Alexey Panferov shares his secret of success. Izvestia: How did your partner acquire Bournemouth? Alexey Panferov: Things just happened. My partner had a number of business projects in Bournemouth and through those met Eddie Mitchell, who owned the club at that time. He suggested that we try our hand at football in addition to joint property development projects. Bournemouth was playing in the first league then and did not aspire to enter the Championship. So it was not a systematic search. That's how things happened. It was an interesting opportunity, which he managed to seize. A year ago, Maxim completely bought out the club from his English partner. Izvestia: Is working with Bournemouth your first football experience? A.P. : I was not involved in football as a manager. I have been a fan of [Russian, Moscow-based team] CSKA since I was three and I follow football closely. I'm a football observer, an analyst. In Bournemouth, I'm in charge of finance, marketing, and, oddly enough, medicine. It is my responsibility to plan, attract investors and coordinate our medical staff. Izvestia: What budget should a team have to fight for Premier League promotion? A.P. : It's not about the budget. The budget of many other teams that do not compete for promotion to the Premier League is much higher than ours. I'm talking about clubs such as Norwich, Nottingham Forest or Middlesbrough. Unlike them, we cannot carry high costs. The most important thing is the economy. If there is no economy, then there is no long-term policy of the club. Our results prove that it is not money that takes the field, but it is a properly built top-down system in the club that is working. 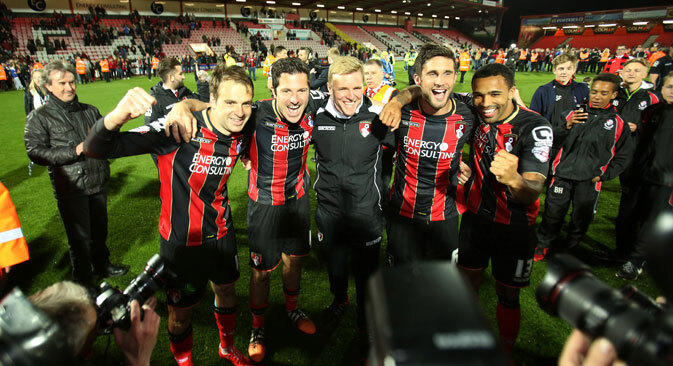 Of course, another key to our success is the club's head coach Eddie Howe. He is England's most talented coach. Howe used to play for Bournemouth, but received an injury at the beginning of his professional career and early on turned to coaching. In England, no one will be surprised if he becomes the next coach of the national team. Izvestia: In its first season in the Premier League, your club will earn £120 million thanks to a TV deal and increased sponsorship. Won't this kind of money change the philosophy of Bournemouth? A.P. : The club will not change its philosophy. No one is going to throw money around. You always have to live within your means otherwise the project cannot be long-term. Look at Portsmouth, which fell by four divisions. Or Blackpool, which dropped down to League One because of financial problems. If it is a long-term project, it is necessary to live within your means. Izvestia: Why aren’t managers like you in demand in Russian football? A.P. : Russia's attitude to football is entirely different. You know how bloated the budgets of Spartak, Zenit, Dynamo and Lokomotiv are. I don’t think that is normal. To run between the owners and meet their desires – that's not my style. I cannot even imagine what I could usefully do for Dynamo. He who pays the piper calls the tune. Izvestia: Are you in contact with Chelsea owner Roman Abramovich? A.P. : We do not communicate. We work with consultants in football finance, marketing and medicine. There is no hidden knowledge here. Chelsea has its business and we have ours. I think that no one took us seriously. Who was interested in talking to us? Rather, we should have been interested, but we did not thrust ourselves upon anyone. Russian businessmen see European football clubs as attractive investments. Apart from Roman Abramovich, those who have invested in British clubs include Anton Zingarevich (51 percent of England's Reading), Vladimir Romanov (51 percent of Scotland's Hearts) and Alisher Usmanov (a 30-percent stake in London's Arsenal). In the rest of Europe, businessman Dmitry Rybolovlev holds the biggest stake - 66 percent in Monaco's team. Russian companies sponsor a number of famous European football clubs. Gazprom sponsors England's Chelsea, Germany's Schalke 04 and Serbia's Crvena Zvezda, while Aeroflot is a sponsor of Manchester United.